Shkodran Mustafi has given Arsenal fans something to to be happy about after losing a whopping six points in their last two games. 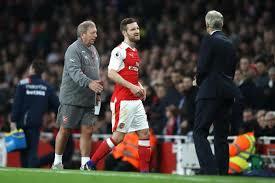 The centre-back sustained a hamstring injury after just twenty-four minutes into Arsenal's game against Stoke City few weeks ago. He has since been missed in two matches which the Gunners found difficult to even get at least one point from. The 24-year-old's patnership with Laurent Koscielny is second to none and one can understand why the Gunners have struggled without him. The German defender who has been out of action for a while made a positive update regarding his injury via his official Instagram profile. Arsenal will host westbrom at the Emirates Stadium on Boxing Day as they look to bounce back from the setback suffered in the last two games.